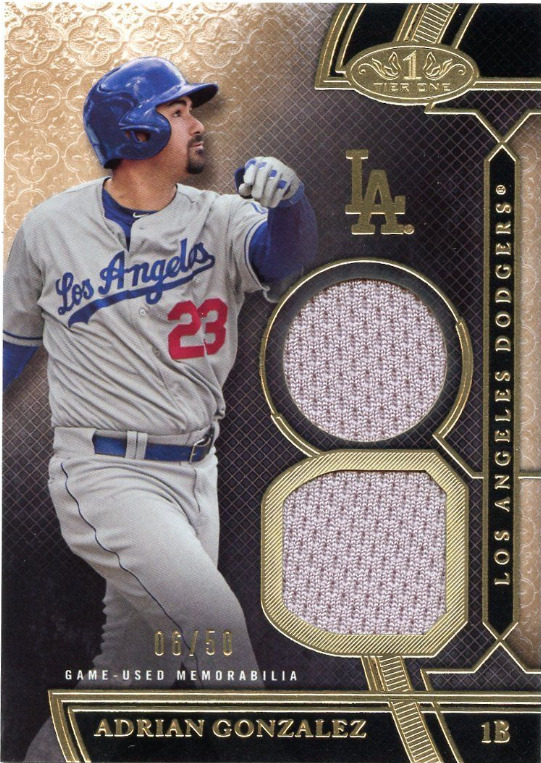 Last week saw the release of Topps 2015 Tier One Baseball card set, and below are examples of the Dodger relic cards that can be found in packs. This is a high-end set. There is no base set. Every card has either an autograph, relic or both. Boxes cost about $80.00 a piece, has only one pack and you get only three cards in that single pack. You are guaranteed two autographed cards and a relic card. Some packs might include an extra relic card. Go here to check out a complete checklist. 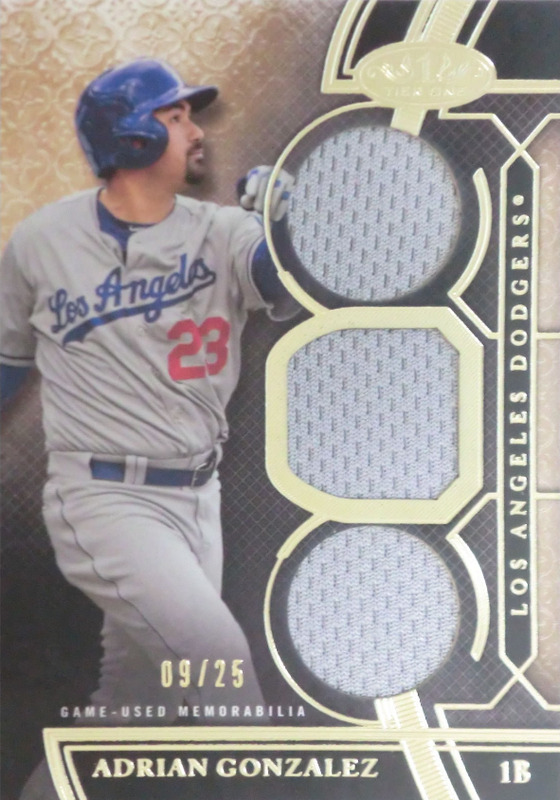 As you'll notice below, each player in the relic set comes with either 1, 2 or 3 relic pieces embedded within them. 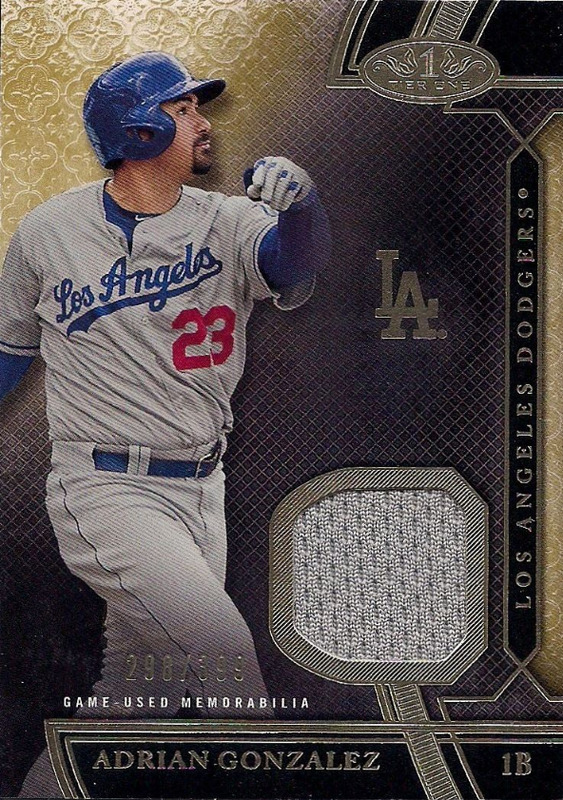 I've provided examples of what each one looks like for both Adrian Gonzalez and Hyun-Jin Ryu below. For the other six players (including the Legends Relics of Snider and Robinson) I show only a pic of the single-relic card. Rumors are swirling. The gossip is reaching a fever pitch. One man, who has had his ups and downs in Los Angeles, may be heading out of town, and I suspect many fans will be less than pleased - although, they'll likely be very understanding of the move. Via Ken Rosenthal on twitter and encapsulated by Jeff Todd at MLB Trade Rumors, "Dodgers, Braves Discussing Swap Of Uribe, Callaspo." 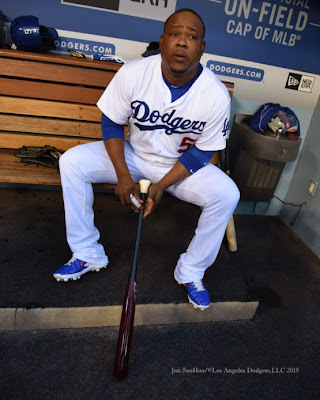 The Dodgers are in discussions with the Braves about a deal that would send third baseman Juan Uribe to Atlanta and deliver Alberto Callaspo to Los Angeles, Ken Rosenthal of FOX Sports reports (Twitter links). Other, “lesser names” would also be included in a deal, per the report. The idea of Uribe being sent off to Atlanta is a little hard to stomach since he's been such a great team player for the Dodgers. He had a rough go of it his first couple of years in Los Angeles, but continued to carry-on with a smile on his face and a hop in his step. He never pouted or complained. Instead, he cheered on and contributed when he could. Eventually his skill shined through, and he became an integral part of the team the past two years. Unfortunately, the club is looking to inject some younger blood, and that leaves Uribe out on a lurch. They recently signed Hector Olivera out of Cuba to eventually man the hot-corner, and there are plenty of options on the bench and in the minors ready to stake their claim in the club. As always rumors like this may come to pass, but I think it's fair to say that we will eventually see Juan Uribe traded before the season is done. If not to the Braves today, then likely somewhere else soon. In fact, a new update indicates that the deal for Callaspo has fallen through due to his rejection of the trade. But like I said above, we should expect a deal to made sometime soon. 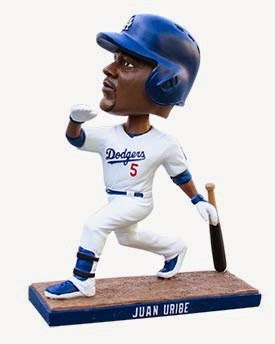 In the "this is awkward" moment, Juan Uribe is slated to receive his very first Dodger bobblehead on Saturday, June 11th, so I wonder what happens if he is traded before this date. Do fans get the bobblehead anyway? Check out a pic of the planned bobble on the right. Via Alex Dopp at the Daily Gammons, "Mike Bolsinger Thrives in L.A. with Effective Two-Pitch Mix." The season is still young and Bolsinger’s starting role with the Dodgers’ rotation is even younger. But we’re beginning to get a sense for why this 27-year-old castaway Diamondbacks prospect has succeeded so far this season: A fairly dramatic change to his arsenal, command of his cut-fastball and the element of surprise that comes along with his curveball — all things that have enabled him to induce weaker contact, fewer balls in play falling for hits and an improved strikeout-to-walk ratio. Via Ken Gurnick at MLB.com, "Dodgers offense out to prove doubters wrong." "There's satisfaction in that we're in first place and we're playing good ball," said Ethier, who had a bases-loaded walk and has six homers after only four all of last year. "I've had a little bit of a hand in contributing to that, that's where I get my satisfaction. Just get to be in the mix and help out with what we're doing." Via Eric Stephen at True Blue LA, "Dodgers sign Mickey Storey to minor league deal." Storey was pitching in the independent Atlantic League. Via John Stolnis at NumberFire, "Is There Something Wrong With Clayton Kershaw?" It appears as though much of Kershaw's problems stem from poor location, something that a pitcher as talented as he is, with stuff as good as his, should be able to overcome.